You can’t add this phone unless it has the same Nexus Protect choice as other phones in your cart. You can update your choice or purchase this phone in your next order. We've modified the page a bit to enable the pop-up for the illustration above. Based on the text, it looks like Nexus Protect is some kind of extended warranty protection plan, similar to Apple Care or the third-party electronics warranties sold by retailers. 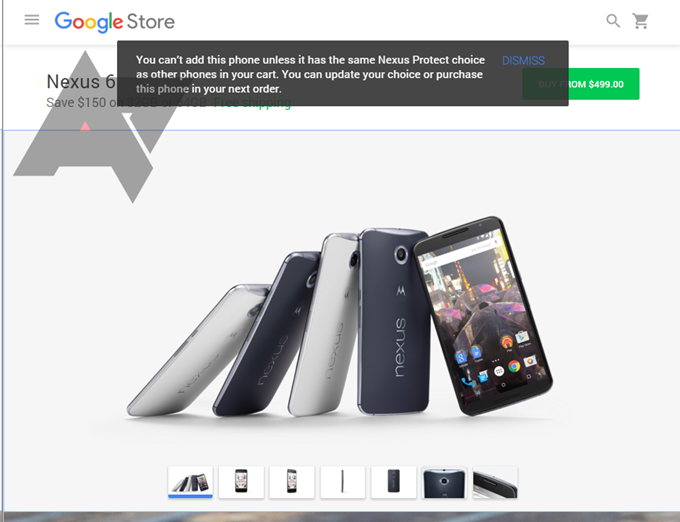 That said, the Google Store seems to be setting up to limit purchases based on Nexus Protect choices - perhaps if you're buying multiple devices in the same order, they need to be all covered by a Nexus Protect purchase, or none at all. Please keep in mind, this is all speculation based on very little information. We've seen Google retail programs like this pop up in official documentation and never appear. The text for the pop-up seems to be enabled on all or nearly all of the hardware in the Google Store, including Chromebooks, Android TV, and Android Wear devices that aren't made by Google. Don't read too much into that - the pop-up warning is probably implemented site-wide. Assuming that Nexus Protect is a protection plan, expect to hear about it when the new Nexus phones from LG and Huawei are announced. We've reached out to Google for a comment, but haven't received a reply yet.